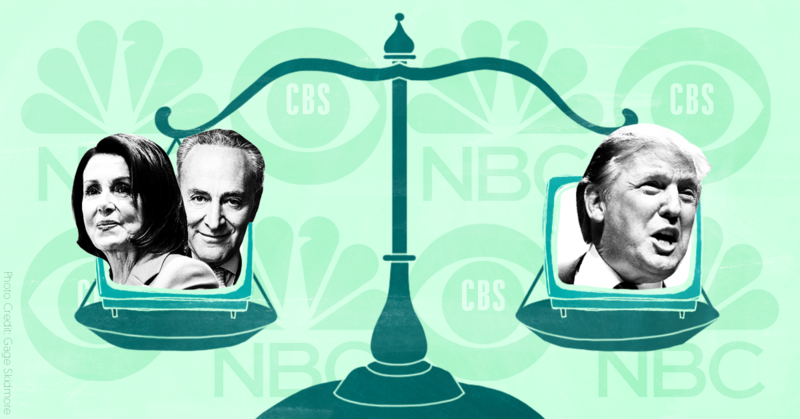 CBS This Morning and NBC’s Today Show embraced “both sides-ism” in their reporting on President Donald Trump’s misleading Oval Office address and the Democratic rebuttal. The networks attempted to paint Trump and Democratic leaders as equally responsible for the prolonged government shutdown and implied that both sides were lying to the American people. NBC’s Today Show began its coverage of Trump’s speech and the Democratic response by promising to “fact-check the claims on both sides” suggesting the possibility of similar dishonesty by Trump, a famous and prolific liar, and Democratic leaders. But while NBC’s Peter Alexander listed several specific lies in Trump’s address, NBC’s Kristen Welker mentioned only two points: that Senate Minority Leader Chuck Schumer and other Democrats voted for a bill in 2006 that authorized fencing at the border, and that Democrats “were well aware” that the recent spending bill passed by the Democratic House had no chance in the Senate without border wall funding. Directly and repeatedly lying to the country is clearly not the same thing as voting for a bill more than a decade ago -- nor is it comparable to pushing legislation without wall funds -- yet NBC’s framing suggested that both sides’ claims were similarly dishonest. Welker also commented that, “like the president, [Schumer and House Speaker Nancy Pelosi] offered no new ideas, instead making it clear they’re still deeply dug in.” This suggested, like CBS’ report did, that Democrats are at fault for a lack of compromise -- even as Trump continues to stonewall negotiations over his unpopular and unrealistic proposal. Both sides-ism has been a plague on political news and analysis for years, and it played an especially sinister role in the 2016 election. News outlets pretending that both sides have equally legitimate points and faults in every disagreement is both intellectually and morally dishonest -- and that dishonesty is bad for journalism and the country.